House in London founded by order of Henry III. 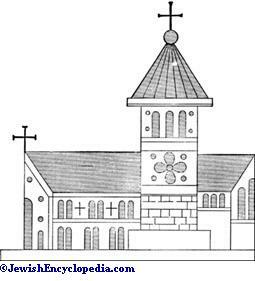 in the year 1232 to provide a home and free maintenance for Jews converted to Christianity. As, up to 1280, on conversion all their property was escheated to the king, they were left destitute. The buildings and the chapel attached to them were erected in Chancery Lane, London, on the site now occupied by the rolls office. The hope was entertained that by the establishment of this refuge there would result a conversion en masse of the English Jews. 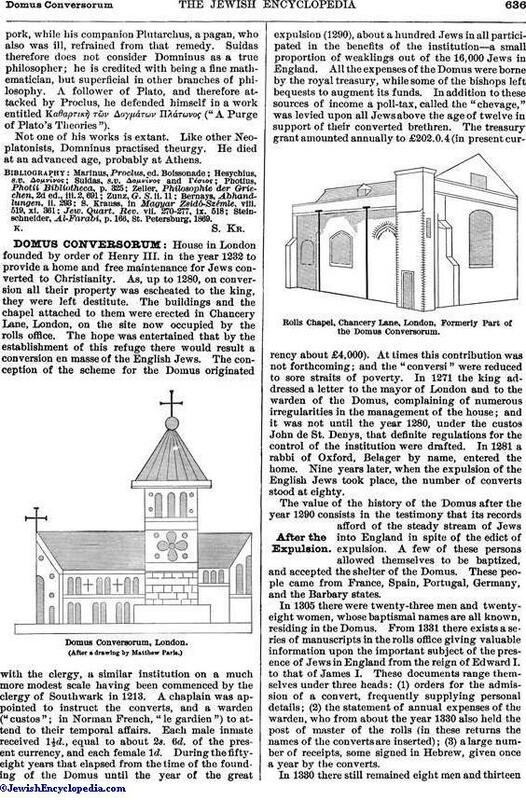 The conception of the scheme for the Domus originated with the clergy, a similar institution on a much more modest scale having been commenced by the clergy of Southwark in 1213. A chaplain was appointed to instruct the converts, and a warden ("custos"; in Norman French, "le gardien") to attend to their temporal affairs. Each male inmate received 1½d., equal to about 2s. 6d. of the present currency, and each female 1d. During the fifty-eight years that elapsed from the time of the founding of the Domus until the year of the great expulsion (1290), about a hundred Jews in all participated in the benefits of the institution—a small proportion of weaklings out of the 16,000 Jews in England. All the expenses of the Domus were borne by the royal treasury, while some of the bishops left bequests to augment its funds. In addition to these sources of income a poll-tax, called the "chevage," was levied upon all Jews above the age of twelve in support of their converted brethren. The treasury grant amounted annually to £202.0.4 (in present currency about £4,000). At times this contribution was not forthcoming; and the "conversi" were reduced to sore straits of poverty. In 1271 the king addressed a letter to the mayor of London and to the warden of the Domus, complaining of numerous irregularities in the management of the house; and it was not until the year 1280, under the custos John de St. Denys, that definite regulations for the control of the institution were drafted. In 1281 a rabbi of Oxford, Belager by name, entered the home. Nine years later, when the expulsion of the English Jews took place, the number of converts stood at eighty. Rolls Chapel, Chancery Lane, London, Formerly Part of the Domus Conversorum. The value of the history of the Domus after the year 1290 consists in the testimony that its records afford of the steady stream of Jews into England in spite of the edict of expulsion. A few of these persons allowed themselves to be baptized, and accepted the shelter of the Domus. These people came from France, Spain, Portugal, Germany, and the Barbary states. In 1305 there were twenty-three men and twenty-eight women, whose baptismal names are all known, residing in the Domus. From 1331 there exists a series of manuscripts in the rolls office giving valuable information upon the important subject of the presence of Jews in England from the reign of Edward I. to that of James I. These documents range themselves under three heads: (1) orders for the admission of a convert, frequently supplying personal details; (2) the statement of annual expenses of the warden, who from about the year 1330 also held the post of master of the rolls (in these returns the names of the converts are inserted); (3) a large number of receipts, some signed in Hebrew, given once a year by the converts. In 1330 there still remained eight men and thirteenwomen from the pre-expulsion period. By the year 1353 the Domus possessed only one convert, a woman named Claricia of Exeter, who had been admitted several years before the expulsion. She died in 1356; and a month after her death a Spanish Jew, John of Castile, found his way to England and the Domus. From the year 1330 until 1393 eighteen men and two women were admitted. Two of these, Aseti Briarti and Perota Briarti, of France, were husband and wife; while Thomas Levyn (Levi), of Spain, ran away suddenly after a stay of thirty-two days. In 1399 a woman named Elizabeth, described as the daughter of Rabbi Moses, episcopus Judæorum," joined the converts. She remained for seventeen years, and married a London tailor named David Pole. In 1409 two women, a mother and her daughter, who had apparently been living in Dartmouth for some time, were admitted into the Domus. There is no indication in the records of how they came to be in Dartmouth or of their native country. The mother, Johanna, died after a stay of forty years, and the daughter, Alice, after forty-five years. The longest period of residence was that of Martin, son of Henry of Woodstock (1413-68); while other converts who lived in the Domus for many years were John de Sancta Maria of Spain (1371-1405), Henry of Stratford (1416-41), John Durdragt of Dordrecht, Holland (1425-55); John Seyt (1448-88), Edward of Westminster (1461-1503), and John Fernando of Spain (1487-1503). In the year 1400 there were two inmates; by 1450 this number had grown to five; and in 1500 there were four converts. The expulsions from Spain and Portugal appear to have had little effect in increasing the number of residents of the Domus. A woman called Elizabeth Portingale (of Portugal) is mentioned in the records from the year 1492 to 1538, Edward Scales from 1503 to 1527, and Elizabeth Baptista from 1504 to 1532. In the latter year two women were admitted, and were given the names "Katherine Wheteley" and "Mary Cook." In 1506 Thomas Cromwell, the vicar-general of Henry VIII., who had been appointed master of the rolls and warden of the Domus Conversorum, lived in the home. After 1551, in which year Mary Cook died, the Domus remained empty until 1578, when an interesting convert, Nathaniel Menda (formerly called Jehooda Menda), was admitted. He remained till 1608. This man had come from the Barbary states and had been publicly baptized in London by John Foxe, the author of the "Book of Martyrs." The receipts given by Menda for his annual pension are, with one exception, all signed in Hebrew characters. In 1581 Fortunati Massa (originally "Cooba," i.e., Jacob, Massa) joined Menda until 1598. The presence of these two quondam Jews in the Chancery Lane home is coincident with the production of Marlowe's "Jew of Malta" and Shakespeare's "Merchant of Venice." Receipt for 45s. 7½d. Paid by the Domus Conversorum of London tO Jacob Wolfgang (1608). In 1598 Philip Ferdinandus, a learned Polish Jew, became a recipient of the benefits of the Domus. This man had been professor of Hebrew at Oxford and Cambridge, and later on at Leyden University. He died in the Domus in 1600; and three years later there entered Elizabeth Ferdinando, perhaps the widow of Philip. 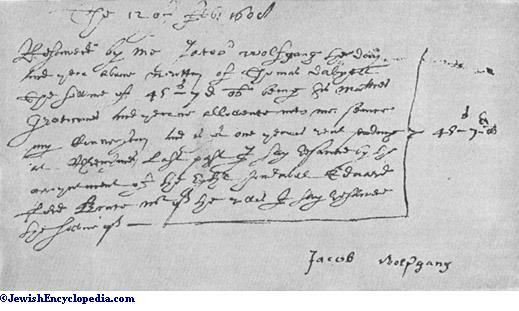 In the year of the Gunpowder Plot, Arthur Antoe was admitted, and in the following year, Jacob Wolfgang, a German. 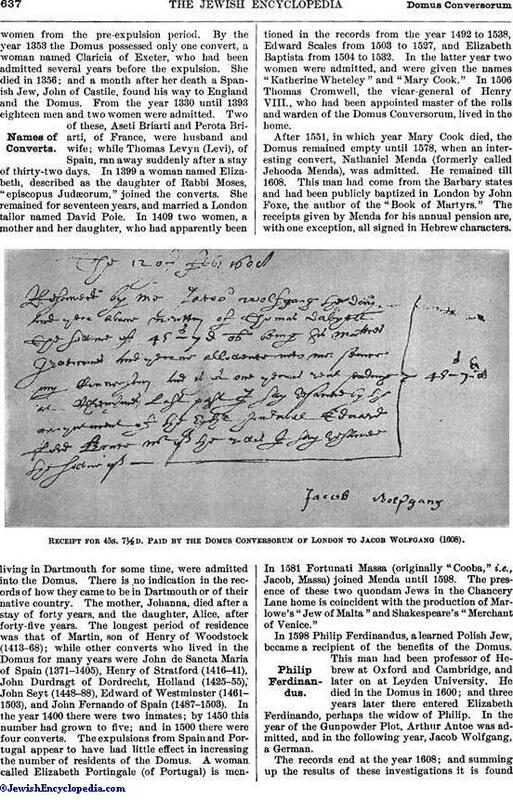 The records end at the year 1608; and summing up the results of these investigations it is foundthat from the year 1331 to 1608 thirty-eight men and ten women entered the Domus Conversorum, while mention is made in the records of the period of four other converts of whom nothing is said in the archives of the Domus. 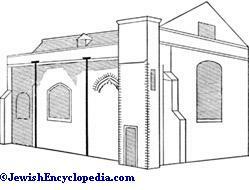 As late as the year 1717 a London converted Jew petitioned King George I. for a grant from the funds of the Domus. The buildings once occupied by the converts were later used as storehouses for the rolls of Chancery, and have since been demolished. 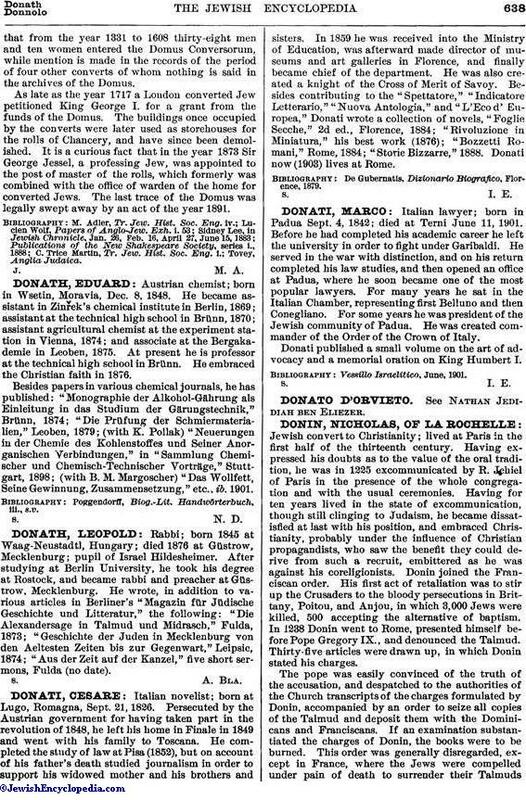 It is a curious fact that in the year 1873 Sir George Jessel, a professing Jew, was appointed to the post of master of the rolls, which formerly was combined with the office of warden of the home for converted Jews. The last trace of the Domus was legally swept away by an act of the year 1891.